Iron Chef Mom Link Party! Each Tuesday Iron Chef Mom Link Party will be found on one of the seven blogs listed above. Weekly Hosts: Each Tuesday the Iron Chef Team will announce via Facebook, Twitter, Google+, where the party is located that week. So, be sure to follow all seven blogs on their social media so that you can easily find the host each week! Featured Ingredient: Each week there will be a 'Featured Ingredient' for the week. You can link up any recipes that you have OLD or NEW that include that featured ingredient! Each week we will announce the following week's 'Featured Ingredient' that way you can plan ahead! 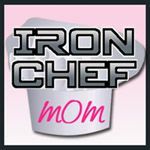 Everyone Welcome: Iron Chef Mom is not just for bloggers; everyone is invited and encouraged to vote for their favorite recipes each week! Featured Recipes: Each week you will have a chance to link up and VOTE for your favorites from that week! You will have an entire week to vote and encourage your readers to stop and vote for you as well! Each week, the Iron Chef Mom with the most votes for their recipe will be named 'The Iron Chef Mom' the following week! Iron Chef Mom's recipe and blog will be featured and promoted through Iron Chef Mom link party and MULTIPLE social media outlets from all the party hosts. Join Us: This is a FUN way to challenge yourself in the kitchen each week. It is also a great way to link up and share your older posts and renew their popularity/reach online. The advantage of linking up on Iron Chef Mom is that you will be discovered and have the opportunity to gain readers from 7 different blog audiences! This is a great way to grow your readership and meet some new blogger friends! Join us for our Kickoff Party this coming Tuesday; October 2nd! The first party will be hosted by Cheerios and Lattes and the 'Featured Ingredient' is APPLES! Grab a Button and Tell Your Friends to Join Us too! This is such a neat idea. I can't wait to follow along and see what everyone comes up with.